Okay, so now you’re wondering if you hit the wrong link and wound up on a page devoted to the citrus industry, the health benefits of Vitamin C, or one of those kitchen cutting utensils sold on loud, annoying late-night TV infomercials. I can promise you that, on this my very first blog and in all the blogs to come, I won’t be writing about any of those subjects. the quality, composition and condition of the instrument’s parts and materials. 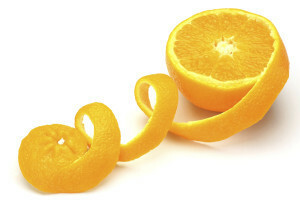 So why orange peels? Well, based on admittedly limited historical documentation, they were among the very first remedies tried by musicians. Of course, that was once they started putting their instruments in cases. Before that, left to lie around on a shelf or hung on a wall, they were subject entirely to the ambient humidity (which is a fancy way of saying “the air around them”). Other methods included damp cloths balled-up or wrapped around parts or all of an instrument, cups of water placed inside a closed cabinet or an over-sized instrument case, sponges, temporary placement in a steam-filled room, outdoor placement (under cover, one would hope) during a rainstorm, and…well, you get the picture. Incidentally, using an orange peel for humidification is a terrible idea because of the potentially harmful effect of the fruit’s acidity. Yet from time-to-time I still see someone touting that method, most often in an online user-group post. Now it’s YOUR TURN. Let me hear from you. Aside from the current products on the market, what methods of humidification do you use? What instrument(s) do you play and what do you consider the best percentage of humidity for it? Aside from (Ahem!) using HUMISTAT-brand humidifiers, what advice can you offer to other musicians about caring for their instruments? That’ll do it for now. My hope is that you’ll join me here (and on our Facebook page) in lively discussions of music, musical instruments, performers, and experiences. We’ll be posting videos featuring musicians—amateur as well as professional—luthiers, and other craftspeople who use our humidifiers. If you have an idea for a video of you or someone else talking about and/or playing an instrument (especially one in the woodwind or acoustic string family), contact us. © 2019 Humistat. All Rights Reserved.